Custom Neon Sculpture - 13"W x 9"H letter max up to 14 letters. Base size 6"W x 6"L x 3.5"H. Sales price not included lettering cost, Sales price listed for BASE only, not including letters. 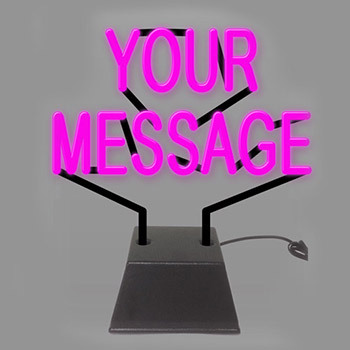 type your custom message & check out for final price. After your order is submit, our Designer will email you a design for final preview approval in within 24 hours. Custom Sculpture Neon Sign 2Just received my Cake Neon Sign. Thank you so much Everything Neon. The sign is perfect and awesome. It will surely change the outlook of my shop.